All teams need to assess their performance periodically to learn what, if any, issues are negatively impacting the team. 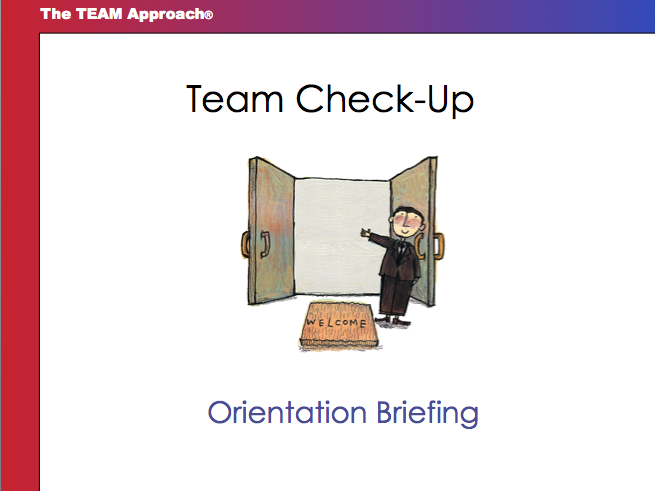 We’ve designed a town meeting process to use with our free Team Checkup. A team leader can facilitate this process using these guidelines or customize these basics to fit a specific need. Increased communication for the team, etc. Explain how to access the free team check-up and how to use the forward feature to send results to you in preparation for the town meeting process. Be sure to explain that when forwarding scores to you, no email addresses are attached to the data. This insures a completely confidential response. If any hesitancy, have team members complete the team check-up forwarding responses to another team member to check the system. It is critical that team members feel free to give honest feedback. Your role in the orientation is to encourage honesty and confidence in this process. A key discussion point in the orientation is to identify what “team” means. Usually, it is a workgroup that interacts with one another in the regular work process. If an entire organization is being targeted as “the team” it is critical that this definition be discussed so team members have a correct perspective when responding to the team check up. Using colored “dots” and the forwarded team check up data, post dots on the 100 point scale for each category to represent the entire teams view (one dot per team member for each catagory – use a separate olor dot for the team leader). Where there is a spread across the scale discuss the gap and solicit specific instances from the t eam members which illustrate the differing points of view. Don’t try to convince anyone to change their position, just hear the viewpoints and record them. Where clusters indicate a high score in a category ask for specific instances that illustrate that strength and discuss ways to reinforce that team behavior in the future and record them. 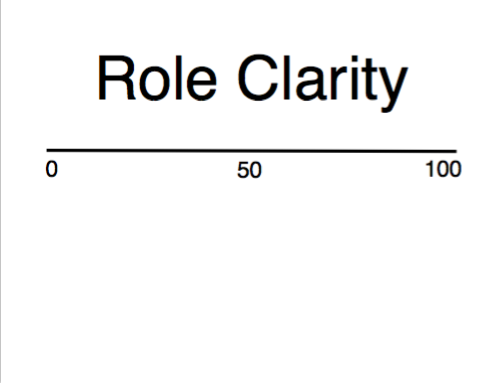 Where clusters indicate a low score in a category ask for specific instances that illustrate that shortfall and brainstorm with the group ideas to strengthen that category of team behavior. After recording the ideas ask the team to select one idea that can be implemented immediately. If the idea requires action by specific team members get commitment and, if necessary, a date for completion. Ask these groups to resist solving the problem before it has been defined. Their task is to describe what the behavior looks like on the team and all the reasons this behavior might occurs. They can use the five why technique. 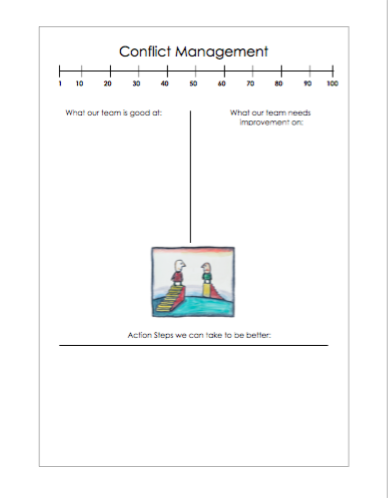 When the time is up, the entire can team move around the room from chart to chart to hear the analysis from each group. After hearing the analysis from each chart, everyone returns to their table. On the tables place a pile of post it notes. Team members write ideas (one idea per post-it) to address problems on each of the charts and post these ideas on the appropriate chart. The groups that did the analysis for each respective chart return to synthesize and categorize the ideas that have been collected. Each person in the room gets one sticky voting dot for the total number of charts that the team is focusing on in this process. As the groups report out on the range of ideas, the team uses one of their dots to vote on the idea they feel they feel will make the biggest difference for the team and an idea they can commit to supporting. Make an action list of ideas that got the most votes from each chart. Each member signs the list indicating they will participate in implementation of these actions, or appropriate groups volunteer to take ownership for execution. The team should identify what success will look like and how they’ll hold themselves accountable to moving forward with the ideas they are committing to in the town meeting. Follow same process for the ground rules. Be sure the list is complete in light of the new commitments the team is making. Are there additional ground rules that will be needed to fully implement these new actions, behaviors, etc? If so refine the list as needed and each team member signs off on the ground rules. Ground rules can be typed up on to a small card and laminated for each member of the team. Schedule a second round of this process within the next 90 days. What has changed? Celebrate the teams successes. Analyise any new problem areas that have been identified following same process. Assess the team on the ground rules. Is the team walking the talk? Post each ground rule on a flip chart with a 1 to 100 rating scale below each item. Have each member rate the ground rules using colored dots indicating how well they think the team is living up to the ground rules. If the data indicates the team is not following ground rules, use the same town meeting process to discover why and what can be done. Host regular Team Check up sessions for your team- at least two times per year after this. Make it a ground rule that the team will keep tabs on itself through this process.